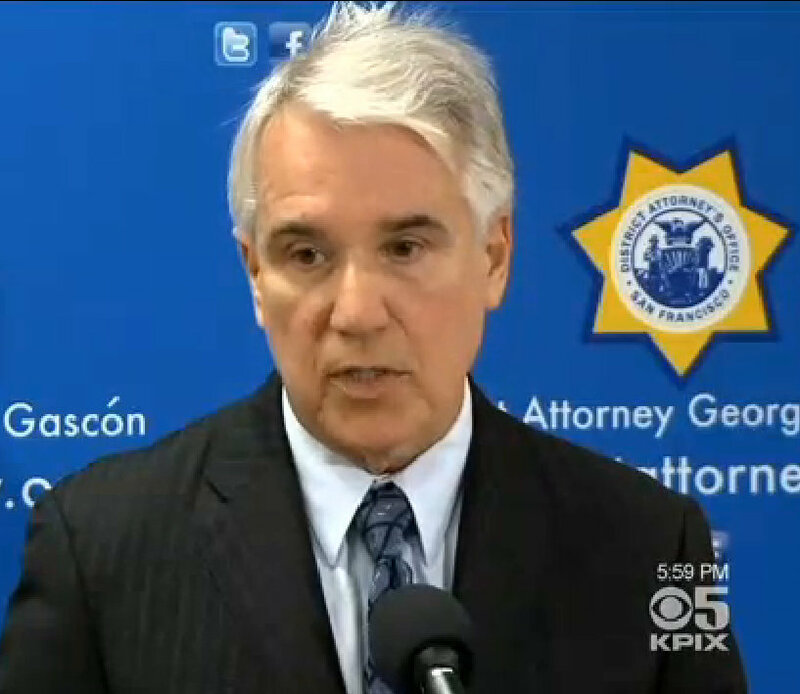 At the press conference yesterday to announce the plea deal between prosecutors and Chris Bucchere in the death of Sutchi Hui, SF District Attorney George Gascón said that his “goal is to send a message” to cyclists. But with charges brought against so few of the 27 drivers who have killed pedestrians in San Francisco since the beginning of last year, it’s hard to believe motorists are being held to the same standard that Gascón applied in this case — a standard that all victims of traffic violence deserve. Have law enforcement officials ever prosecuted a driver with the stated intent of sending a message to all people who drive? Or made broad, sweeping statements about motorists’ view of the law? Sixty percent of the 238 motorists found to be at fault or suspected of a crime faced no criminal charges during the five-year period, CIR found in its analysis of thousands of pages of police and court records from Alameda, Contra Costa, Santa Clara, San Mateo and San Francisco counties. When drivers did face criminal charges, punishment often was light. Licenses rarely were taken away. Of those charged, less than 60 percent had their driving privileges suspended or revoked for even one day, an automatic penalty in drunk driving arrests. Forty percent of those convicted faced no more than a day in jail; 13 drivers were jailed for more than a year. By contrast, those charged in accidental shootings often serve lengthy jail terms, according to media reports. Holding deadly drivers accountable doesn’t fall completely on Gascón’s shoulders — SFPD deserves a big share of the blame as well. But law enforcement has certainly failed to consistently seek justice for the victims of traffic violence and their families. When asked whether drivers will be charged in specific cases of pedestrian injuries and fatalities, the DA’s office often says it can only investigate cases that are submitted to them by the SFPD. Walk SF Executive Director Elizabeth Stampe said Gascón’s record of charging drivers is actually stronger than that of most district attorneys. Stampe was referring to two victims recently killed by drivers. Both drivers appeared to be at fault, but have faced no charges. Madfes, a 68-year-old retired teacher, died after she and her husband were hit in a crosswalk on West Portal Avenue in March. “I looked up as we hit the ground, and the walk sign was green,” her husband, David Madfes, told the SF Chronicle after the crash. The SFPD forwarded the case to the DA’s office for investigation, according to the Chronicle. On May 13, 2012, just over a month after Hui died, 47-year-old Sena Putra was killed by the driver of a gasoline tanker at Mission and 13th Streets in a crosswalk. The next month, Robert Yegge, a student at University of San Francisco, was killed on his bike by a truck driver who failed to yield at Oak and Franklin Streets. Gascón’s office has not responded to a request for comment and updates on those cases today. In the cases of both Putra and Yegge, SFPD determined that the driver had failed to yield. It’s still unclear why the DA hasn’t brought charges of felony vehicular manslaughter against those drivers, as he did against Bucchere. When Streetsblog asked Gascón about the deaths of Putra and Yegge last June, he said he hadn’t heard of them, and it’s unknown if the police ever submitted the case to his office for investigation. At the time, Gascón’s response as to why so few charges were brought against drivers who kill pedestrians was that most pedestrians were at fault for their own deaths. As we reported, that victim-blaming assertion was not only wrong, it also just doesn’t apply to the cases like Putra’s and Yegge’s, who weren’t found at fault. That mentality still seems to persist, however, among top law enforcement officials. When addressing matters of pedestrian safety, SFPD Chief Greg Suhr has consistently focused on “distracted walking,” despite the complete lack of data to support the notion that it’s an actual cause of pedestrian deaths. Bringing justice to all victims of traffic violence starts with transforming the entrenched car-centric culture that turns a blind eye to deadly driving behavior. Until that changes, law enforcement is sending a clear message to motorists: Killing someone with a car is just fine, as long as you’re sober and stay at the scene. There are also crowdsourced (driver-to-driver) apps to warns one’s fellow drunks where the sobriety checkpoints are. Most common phrase I hear after a driver nearly kills me with his/her car. Court Applies Reckless Driving to Bikes. When Will Gascón Apply it to Cars?